Skyrim…oh, sweet Skyrim. Is there any sweeter rose in the euphoric garden of videogaming? Not many. Skyrim is…it’s…there’s a lot to cover here so let’s take this nice and easy. 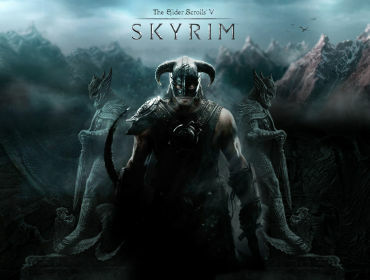 Skyrim is a game in which you play as Dovhakiin, a dragonborn. A dragonborn is a mortal creature with the soul of a dragon, remember that because it’s important – because of this you can traverse Skyrim’s vast open world and find words of power, or as the videogame calls them, ‘thuums’. These grant you new abilities that can aid you in your infinite amount of quests – some include fire breath which gives you the power to spit flames or storm call which basically makes you a god as you shout to Sorvngarde (Skyrim’s Heaven) and command it to shoot down lightning upon your foes, of which there are many. The storyline is a masterpiece of well-written dialogue, unique and sometimes quirky characters, all in the middle of well-designed battles and quests. Your main enemy is Alduin, the world eater – he is an immortal, ancient dragon who seeks to destroy Skyrim’s world and all who inhabit it. The unique thing about Alduin is he’s not some run-of-the-mill-generic-villain-seeking-something that will give him the power to end the world, no, no, he is the end of the world – however he has one weakness, the dragonborn AKA you! You are the last of your kind and so it is from this that your destiny is written, and you must defeat the world eater. 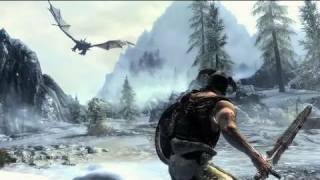 The storyline is quite small for an immensly large game but after you draw your sword from Alduin’s skull, you’ll realise that Skyrim’s main storyline is actually one of the smaller ones. There is literally an infinite amount of quests to complete, all of which give you rewards, be it money, or the more luscious petal on this videogame: ‘rose’; or equipment and these can range from anything like maces, swords, axes or if you like DLC, crossbows! The best weapons, however, are the Daedric weapons – they get their names from the Daedric Princes, which are basically Skyrim Gods. The quests mainly have you dig deep into the ruins of ancient Nord (Skyrim’s humans) catacombs, where you will fight a vast wealth of enemies, like Draugr (Zombies), giant spiders, giant rats, living skeletons and ancient dragon Priests…just to name a few. Still not enough to do? Then join a group, Skyrim has many – the groups usually start you off with a mission to test your skill, if completed they will let you join. There are The Companions, a group of well-paid warriors who house a dark and awesome power. There’s the Thieves’ Guild who control much of Skyrim by means of thievery, corruption and murder who will eventually lead you to an even greater group. There’s the Collage of Winterhold, which specialises in the practise of magic and alchemy who will teach you spells that can make even the mightiest heroes quake at your feet. Notice these three very different groups of warriors, thieves and mages. Well, though it is not forced upon you these are the three main character types you can choose to be. And there’s something that must be mentioned, Skyrim’s options – wanna be a good guy? Wanna be a bad guy? Wanna be a lone ranger or a mighty leader? The choice is yours. Lastly, I must mention Skyrim’s atmosphere…wow…j…just…wow! Skyrim is based on Viking culture and features great landscapes from colossal snowy mountains to gentle sloping hills, makes me feel like I’m in virtual Wales. At your side is the greatest companion of them all…Skyrim’s soundtrack. It’s a beautiful mix of gentle orchestrated bliss to high octane, fast-paced battle music. It would be a crime not to give mention to the games mastermind of a composer, Jeremy Soule. Although you’ll never truly finish Skyrim (especially with the games 3 DLC’s!) I assure you, you’ll enjoy every single moment of it. Phone Companies – As Helpful As You Think?